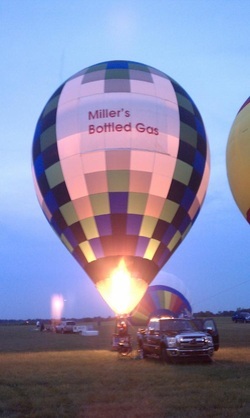 The weekend after Labor Day meant an annual trip to Bowling Green, KY for the Balloons, Tunes & BBQ festival. This year they boasted a completely free to the public event for parking and gate access for pedestrians and then tether balloon rides, concerts and of course bbq were all available for purchase. Friday night was the scheduled glow/tether and with the winds just on the borderline of too windy to tether only four balloons were able to tether with full three point systems but the rest of the balloons were able to get up and glow for a little bit more than 30 minutes. The crowd was big enough to keep the line open for the tether rides benefitting the United Way well past sunset. Saturday morning pilots were met with heavy down pours and windy conditions and everyone received a text message at 440am canceling the mornings flight and scheduled breakfast, which was to be outside. Saturday evening brought clear skies but fairly windy conditions with winds around 8 mph gusting to 14 at times. 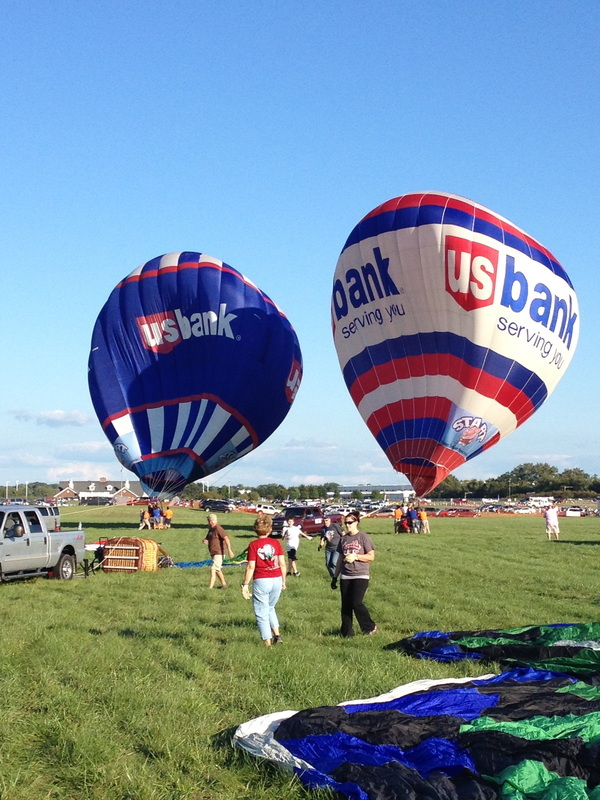 Task caller Travis Vencil declared a double HNH with a bit of a twist, instead of one balloon flying and dropping two Xs both US Bank balloons would fly and pilots would have to navigate toward both balloons to get scores. Only five balloons were able to get inflated and in the air to follow the hair balloons and only one score was recorded to young pilot DJ Stukas (21) who has vastly improved his flying as the year has progressed earning him $300. The rest of the money for the evening was split amongst pilots who flew. The tasks were decided overnight to not count toward the overall rankings without much of an explanation given which evened out the playing field with reset scores of zero for all pilots. Sunday morning brought very steerable and stable winds with about 130 degrees within 1300 feet. After a bit of confusion based on how the tasks were labeled a solid four part task was flown. The first being a HWZ with two goals just to the west of the main airport field. Most pilots went to target 'B' as it offered a slightly better flight path to the next three targets. The second task was a minimum distance task that allowed for scores only on the taxi but scored out 1000'. There were not many scores on this target as pilot elected to stay high and continue toward the main field where 2000 points was available for the morning. The next two targets were a GBM and a FIT based off the same X. Basically the closet score to the center of the X would get the best score for both targets. After the morning was complete Chris Spalding who was flying one of the hair balloons for US Bank on Saturday night won the event with three very good scores followed by Nick Donner and Tim Slattery. Pics and video will be loaded as they become available. We have some interesting video from the flight Saturday evening. Scores are below.